The What: Mersive Technologies has added support for Miracast screen mirroring on its Mersive Solstice wireless collaboration solution. With this addition, Solstice users can now wirelessly share content onto a display using the native screen mirroring capabilities of all major operating systems: Windows, MacOS, Android, and iOS—even in cases when a user doesn’t have the Solstice app. The What Else: Building on its core wireless collaboration solution, Mersive is leveraging Solstice as a platform to continue expanding its offerings to improve the meeting experience. In this software release, Mersive is also including an accessibility improvement called Spoken Screen Key. The feature can be enabled to assist the visually impaired, by speaking the screen key when a user tries to connect. This follows room calendar integration and digital signage capability announced earlier this year. 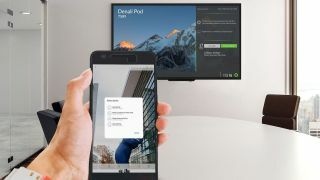 “Miracast is a pervasive technology for people who want to wirelessly share content and it can now be used to share to a Solstice enabled display,” said Christopher Jaynes, Ph.D., founder and CTO of Mersive. “This puts native Miracast users on par with the Solstice app to share presentations, videos, apps, and photos. For example, Solstice now supports meetings where iOS and MacOS users engage with Miracast-enabled devices without the need for an app or dongle. It’s a great feature for guests and occasional users of Solstice who may not already have our app installed. We’ve implemented support for both Miracast standards: Wi-Fi direct, an older but reliable standard that doesn’t utilize the existing network, and Wi-Fi over Infrastructure, that leverages the enterprise network to ensure security and manageable traffic. This gives administrators flexible and secure deployment options. The Bottom Line: The Miracast screen mirroring protocol is a growing industry standard. It was ratified by the Wi-Fi Alliance in 2012 and is now native in millions of devices worldwide. Many refer to it as "HDMI over Wi-Fi," as tech media giants such as Amazon, Roku, Android, and Microsoft have adopted it as their standard. Miracast over Infrastructure is a new extension to the standard that recognizes the value of routing Miracast video over the existing network and was introduced by Microsoft in 2017.